Memphis is an easy town to live in. Our housing's affordable, traffic's not bad, and the food is amazing... and sometimes amazingly cheap. Here you can skip the drive-thru when hunting for cheap eats, as many restaurants -- even fine-dining spots -- have you covered for around 10 bucks or less. Save money by stopping at any of these 25 cheap places in town and put that extra cash towards beer and Grizz tickets. 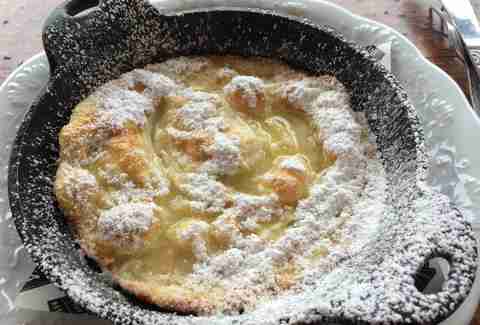 If you don't know about Dutch baby pancakes, you haven't truly lived. They're a cross between a pancake and a popover -- eggy and sweet, with a hint of lemon. It feels like eating dessert for breakfast, and what's better than that? It's so cheap ($5), you can get a super fancy coffee and still not break a Hamilton. 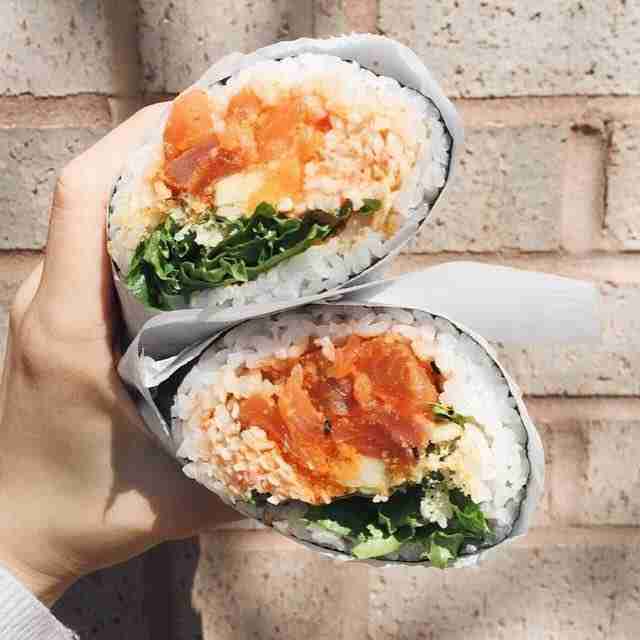 It’s hard to get a sushi fix for less than $15, but the Red Dragon Sushi Burrito is a $10 handheld monster featuring spicy tuna, cucumber, lettuce, avocado, purple cabbage, and masago. And it absolutely delivers. For $12, you'll be rewarded with a vegetarian platter. It's technically made for one person, but will easily feed two. The platter features spicy and mild mesir wat served with a combination of veggies and salads... PLUS a basket of injera (an East African flatbread). Do not miss out on the Golden Hour of Pizza! 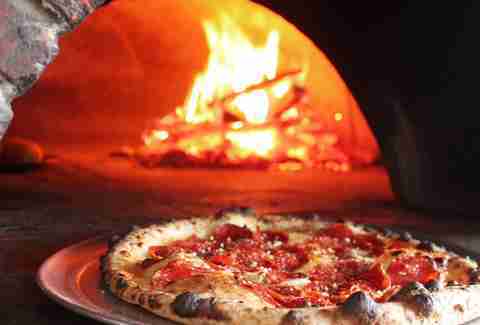 All (yes, all) of the delicious, wood-fired pizzas are $10 from 2-5pm Tuesday through Saturday. The margherita is second to none, but you really can't go wrong at H&H. You'll want to bring friends as well… and they'll want to join you. Load up your BYO-bowl with whatever vegan, gluten-free, dairy-free, meat-free, fresh and yummy grains, veggies, and (vegan) proteins you want. Then douse them in your choice of house-made sauces... all for $10. 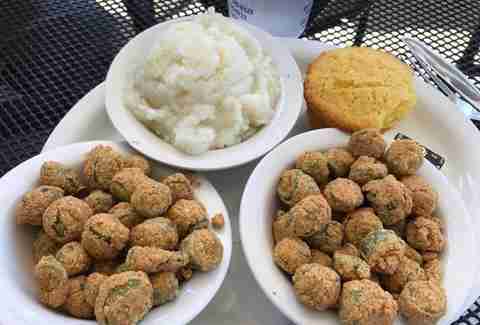 Three fresh vegetables (or sides) with cornbread is a major steal at $7.75. Keep in mind the wide definition we're applying to “vegetable” in this town. Choices include hush puppies, French fries, coleslaw, mashed potatoes, pickled green tomatoes, cucumber salad, Cajun cabbage, sweet potato fries, broccoli, black beans, fried okra, black eyed peas, green beans, mac & cheese, corn, zucchini, collard greens, and white beans. The customers are always the lucky ones when Lucky Cat does a pop-up. It's single-handedly changing everyone’s idea of what ramen is with its taste bud blowing bowls. The half size is plenty for one person ($7), but be warned, the cravings will start once you get a taste of their exquisite broth, so you might wanna plan for leftovers with the full version ($12). 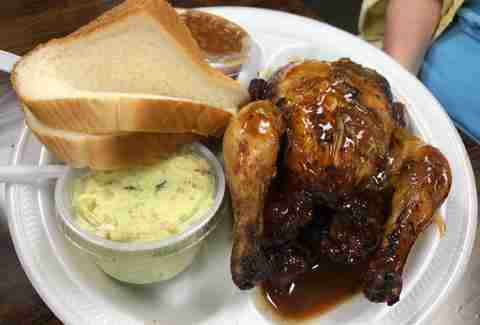 There’s only one place in town to get an entire Cornish hen barbecued to perfection... and that’s at Cozy Corner. Now back in their original building, the hen, two sides (beans, spaghetti slaw, corn, potato salad, chips), and bread is a deal and a half clocking in at $12. 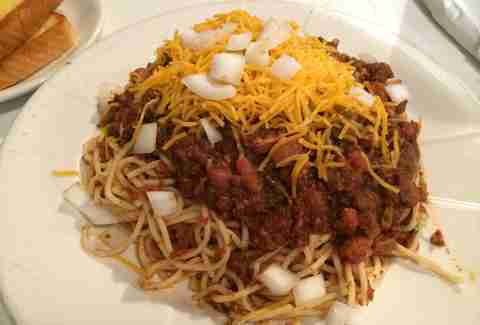 Plus, you can’t really call yourself a Memphian if you haven’t tried it at least once. 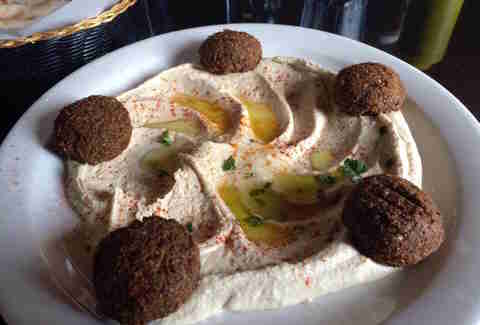 Transport yourself to the Middle East with the best falafel and hummus in the city. Listed as an appetizer, this dish makes a perfectly respectable lunch or dinner thanks to the big basket of accompanying pita bread. Best of all you can add a cup of their delicious tea and still get out under $10. Bari’s doors open at 5pm daily. Be there at 4:59, saddle up to the bar, and treat yourself to the most delicious dish this side of the Atlantic -- the frutti di mare fritti. Frutti di mare fritti is fried fruit of the sea -- fresh calamari, smelt filets, and sardines, all lightly breaded, fried, and served with salt and lemon. The lemon, which is also lightly breaded and fried, should be consumed in its entirety. All for $11. Catherine & Mary’s has a ton of can't-miss options in the $12-$15 range, but every day during Happy Hour (4-6pm), the spuntini menu has a handful of $5 snacks. 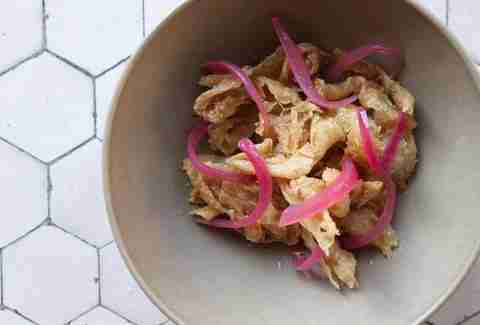 The major stand out is the fried chicken skins, seasoned up with maple syrup and mixed with pickled red onions. 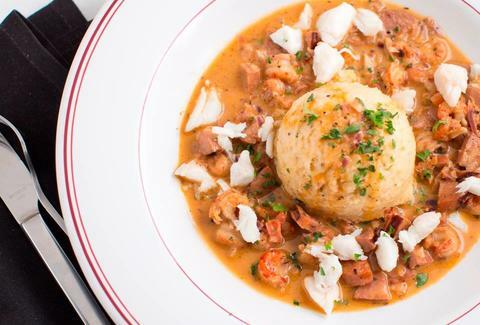 Char has many delightful menu options, but for those on a budget, the $7 gumbo bowl (with crab, shrimp, and andouille) is easily the best in the city. Brunch is an especially opportunistic time to visit Char, and sitting near the bar will put you in close proximity to some mighty fine music to soothe your savage hangover. Ah, the bi bim bop. Come for a $10.99 sizzling-hot bowl of rice, veggies, bean sprouts, spicy sauce, and the meat of your choice all topped with a sunny egg that's almost too pretty to eat. Grab some chopsticks and mix it all together while the sizzle evenly distributes the yoke. It's hearty, satisfying, and seemingly pretty healthy. To pinch a few more pennies, order the Bi Bim Bap burger for $6.99 instead and get all of the same flavors, no chopsticks necessary. Memphis has a lot of affordable hot wing options, no doubt, but there's only one place for Rainbow Wings. They feature a panang curry, fresh lime, and lemongrass dipping sauce, which is a total game changer. 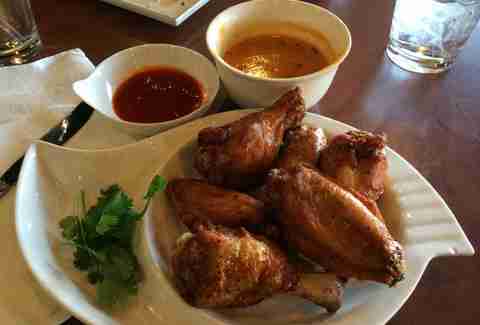 The curry is sweet, spicy, and tangy all at once, and the wings are perfectly crispy. It's $5 for four and $6.50 for six. We all know Dino’s has great ravioli and a pretty amazing plate lunch special, but did you know they have the best breakfast deal in town? First off, no line, no waiting. From 7:00am-11:00am Tuesday through Sunday you can get all of your favorite breakfast items including pancakes and waffles. The best deal on the menu is the two eggs any style which comes with your choice of biscuits or toast (but biscuits, duh!) and your choice of hashbrowns or grits for a mere $4.00. With everything from brown rice, beet, and black bean to jerk pork, the $10 mix & match sliders are both crowd and wallet pleasers. The Original Memphis and Chick-N-Fill-Ay buffalo style are favorites. An order of three (any three!) 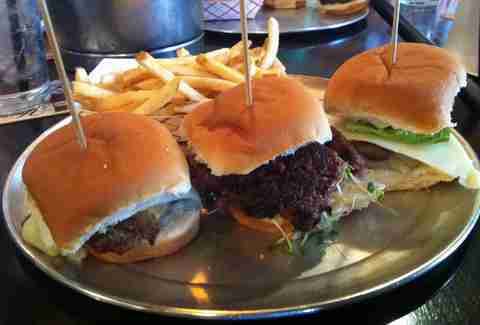 comes with Slider's famous salt and sugar sprinkled skinny fries and bourbon-mayo dipping sauce. A small, crunchy baguette is the foundation of this sandwich, which includes house-made liver pâté, flavorful crispy-barbecued pork, cucumber, pickled carrots, daikon radish, sliced jalapeños, and fresh cilantro. 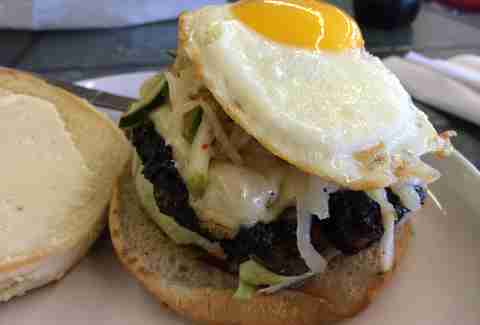 The crispy pork makes it a standout from every other banh mi in town. At $3.99 a pop, you can even afford to feed a friend. You have to feel sorry for people who don't live in Memphis and can't simultaneously get their BBQ- and-nacho fix. Now standard on many menus, Central's are the best and biggest. The nachos are simple, but delicious. There's processed cheese topped with tangy BBQ sauce, perfectly smoked barbecue, and pickled jalapeños if you so choose. Opt for the $5.75 half order, it'll be enough. 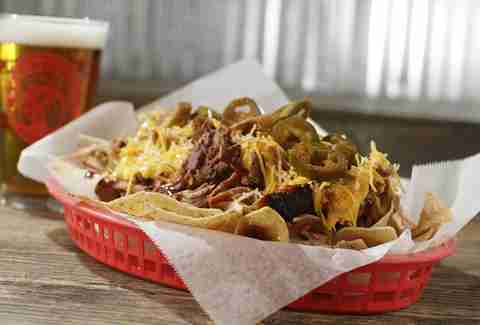 Pro tip: Central's house-made BBQ chips can be substituted for the standard-issue tortilla chips. 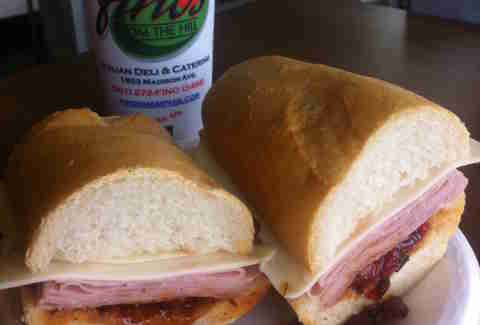 All of the sandwiches at Fino's are a deal, and a half of one is usually more than enough. The best is the prosciutto cotto, however, which is a sweet boiled ham topped with provolone and roasted red pepper marinade. The whole sandwich will set you back $8, but you can snag a ½ of one for $5.25. By the time you get a seat for a top-tier brunch at Brother Juniper's, you are sure to be extra hungry. The black bean breakfast burrito will fill you up and then some, all for $8.95. The large flour tortilla is filled with black bean vegetarian chili, egg, and cheddar cheese, then topped with salsa and sour cream. You also get home fries or grits, and biscuits or toast. 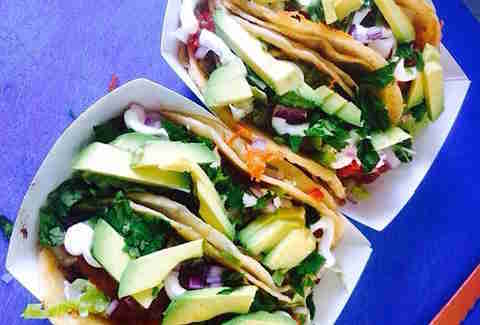 We've got taco trucks and authentic Mexican restaurants up and down Summer Ave, so finding a cheap taco is not hard. However, should you want vegetarian tacos so good non-vegetarians line up to order them, check Facebook or Twitter and find the Fuel Truck's current location or go straight to the restaurant, which finally added them to the menu (at two for $7). Made with fresh tortillas gently glued together with cheese, Fuel's signature veggie burger patties, and a load of fresh toppings, an order of two is a meal in itself. Add the fresh avocado for an additional buck (vegan, chicken, and bison tacos also available). The $5.99 shrimp tempura is the top seller at our beloved gas-station sushi spot, but all of the 12-piece rolls are worth a try. Instead of avocado, which tends to brown, Lee's uses cucumbers for a nice crunch. It also has a special rice formula that keeps the sushi from getting hard. 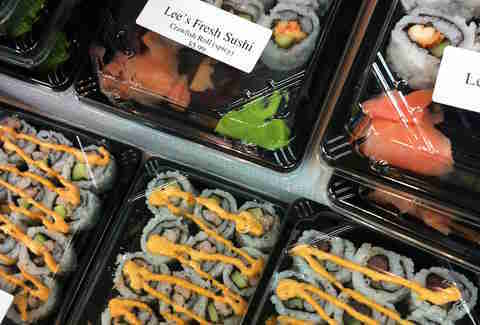 It makes sushi fresh all day, and is mindful of the fact that the rolls can be refrigerated for several hours. The Pho Binh lunch buffet (M-F 11am-3pm, $7.49 dine-in and $8.99 to go) immediately comes to mind for local cheap eats. It's where vegetarians and meat eaters alike gather to worship perfectly fried tofu. 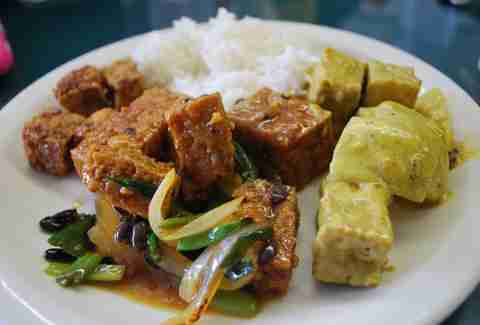 Lemongrass tofu, black bean tofu, and coconut curry tofu are just a few of the options available among more traditional buffet fare. 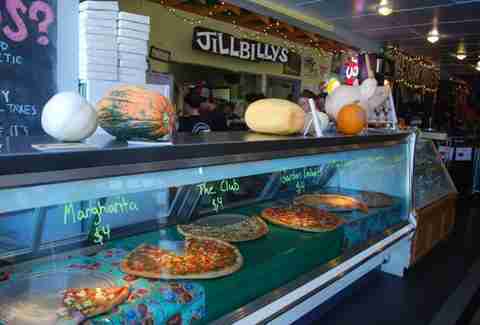 There's no better or bigger slice of pie in town than at Trolley Stop Market. One is quite filling, but two is still in the budget. Go at lunch and get the Slice Combo Special: one slice of pizza, side salad, and fountain drink for $8.99. Slices vary by day and are displayed up front. Breakfast-for-dinner lovers, unite! Have a seat at Andrew Michael's bar and treat yourself to the best breakfast (for dinner) in town. 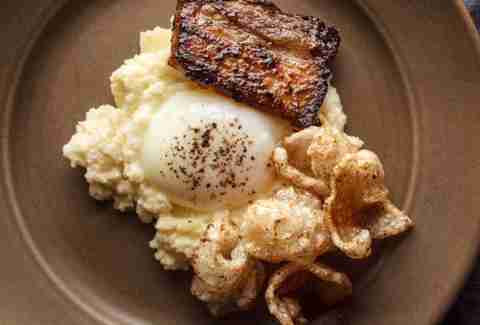 The meal includes a perfectly poached egg, pork belly, polenta, and house-made pork rinds all together on one plate! It's the total package of crispy, creamy, salty, and fatty... and you can have all that for just $11. Stacey Greenberg lives in Cooper Young with her two sons. She is the author of the award winning Dining with Monkeys blog.